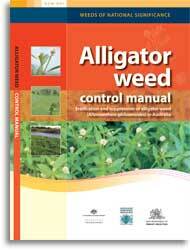 Alligator weed is one of the greatest threats to waterways, wetlands, floodplains and irrigation systems in Australia. As a weed that can grow both on land and in water and can tolerate a range of control methods, alligator weed has serious impacts worldwide and in Australia (see NSW WeedWise for information about alligator weed). This control manual brings together information and advice from over 30 years of research. The information has been reviewed by technical experts, managers and practitioners in order to extract the best and most effective advice for eradication, suppression and containment of alligator weed in Australia.